Many of you have been asking and now I am finally answering your pleas for this loft bunk that would accommodate a full sized mattress. 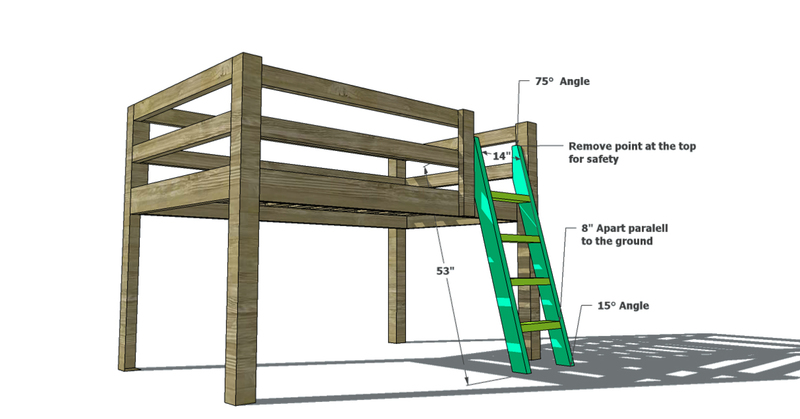 Easy to build, and extremely budget friendly, this Free Woodworking plan to build a full sized low loft bunk is just the project for those of you who need a bit more vertical storage space. 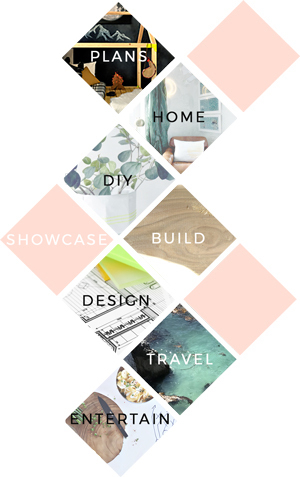 I always say, ‘when in doubt…build up’! **I recommend finishing your boards and posts prior to assembling and simply touching up later. 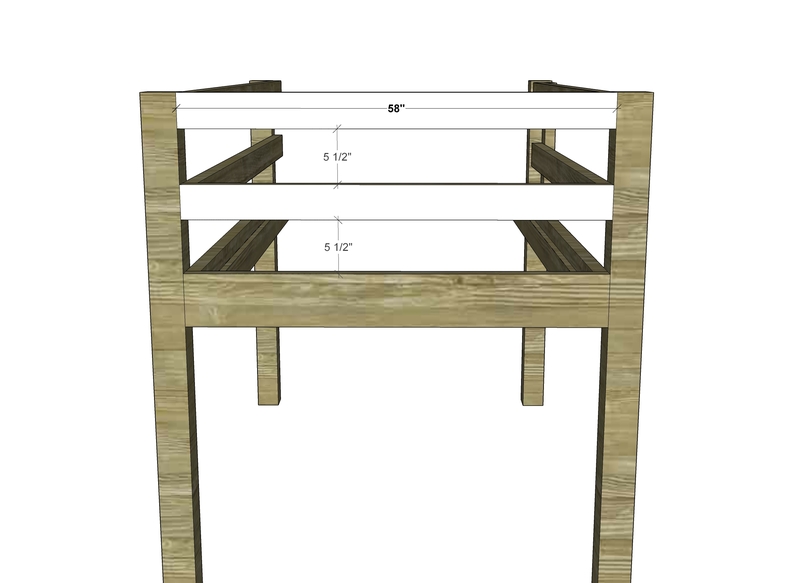 This will make for easier painting and will keep you from having to paint this wherever this piece will actually live (bedroom) since you will have to assemble it in the area it will be placed (at 45 or more inches wide this will not fit through a doorway after it’s assembled). Cut the Legs to size and attach the Cleat to the Front and Back Rails using 2″ Screws. To attach the Rails to the Legs you will arrange the 4 pieces as shown in the diagram below, making sure to leave 1 1/2″ on either side of the Rails to allow for the Side Rails later, and clamp together making sure everything is completely square before you proceed. Once square and aligned as needed, you will use a 5/16″ Drill Bit and drill through all 3 pieces on each side, creating 2 holes on either side for the bolts. Fasten with your Carriage Bolts and tighten. Create the Ladder. I give approximate dimensions for the height below, but the important aspect to focus on is the angle you will cut the top and bottom. The top of the ladder rails will be at a 75°angle and the bottom of the rails will be a 15°angle where the boards will rest on the ground. Attach the rungs at approximately 8″ apart (this will depend on the age of your kiddo, the smaller and younger, the closer together these should be, you need to consider how easy it will be for them to climb down) and parallel to the ground. Use 3″ Screws to fasten the rungs to the rails and to fasten the rails to the Leg and Front Guard Rail. I suggest cutting away the point you will create at the very top, when you cut the 75°angle, for added safety. This will also give your ladder a bit of a hand grip up top. This will easily hold an adult, and probably 2 or 3, but if anything feels wobbly or loose at any point, you can bulk up and add a second joist running from head to foot! That will absorb the weight and good to go! Hey! What would have to be changed if you want the loft bed to be taller? Thanks! 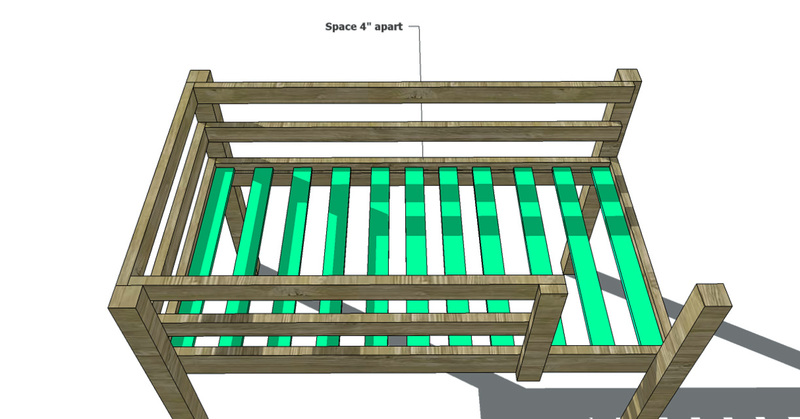 as long as your platform bed is a full sized bed, then yep, should work beautifully! BUT, consider securing the slats in some way because they run a high likelihood of shifting and bunching and of course down you will go – eek. 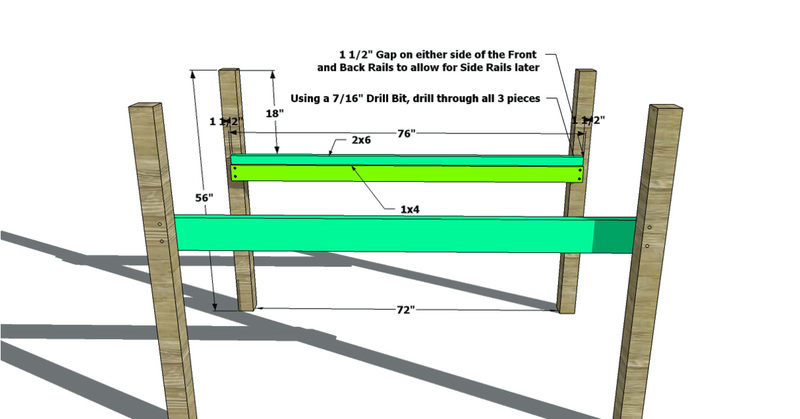 What are your thoughts on using 1×4 lumber for the upper rails? i don’t love it quite as much, but it would very likely work out just fine. they act to stabilize the vertical pieces while they also act as rails. i tend to go overboard on the safety and stability so i think as long as you use something other than mdf and do in fact use wood, it would likely be alright. I’m going to be ordering a full size mattress online. I see that they vary a few inches by brand. I’m wondering what is the maximum mattress measurements that will fit? Thanks! we generally design our full sized beds around a mattress that is 54″ x 75″. we give them all a tiny bit of wiggle room all the way around so that it is not difficult to make the bed. that being said, it will work just fine if it is a tiny bit larger. if you need more than an inch difference, i suggest adding the amount of length or width you need to every piece that runs in that direction. so if you need it to work for a mattress that is 56″ x 75″, add 2 inches to every piece that runs width-wise or parallel to the head and foot board! hope this helps! I see you in the lumber list that you have 1 2×4 at 6 foot listed twice. Do we need two for this plan or just one? It is currently 36″. You can easily increase the height by 2″ by simply increasing the leg height and the length of the ladder. I think everything else will stay the same and this is a fairly simple modification! 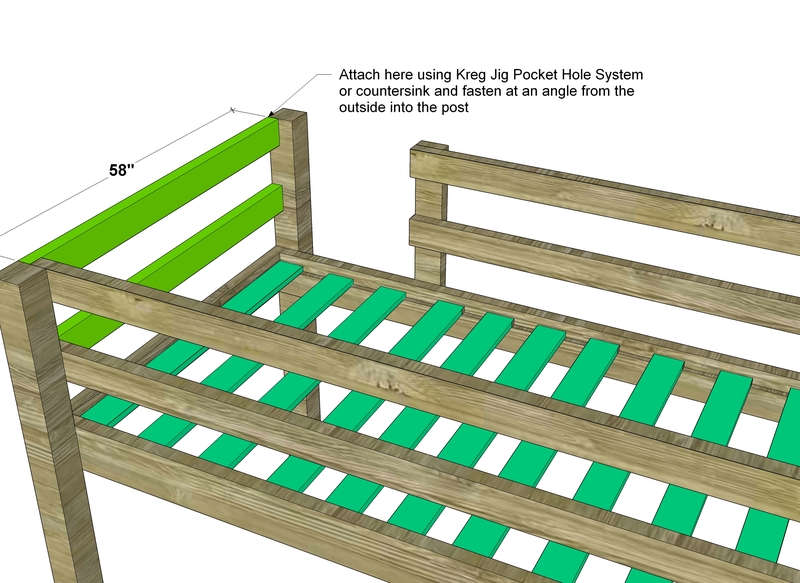 Hi I really want to put this bed together for my son but I don’t understand the demensions, can you help me convert it to cm? Also, is it safe to assume that the 4 side upper Rails are 55″ and not 52″. Yes it should be 58″! Sorry you guys, lost it on the diagram… hole should be 5/16″ and use a 5/16″ drill bit. Since the carriage bolt will also be 5/16″, you will benefit from the use of a mallet to get ‘er in there. On the lumber list you have that we need 1x4x6, in the cut list there is NO use for them. can you explain, help, or update. no problem! so, you need a number of 55″ slats and it works out most affordably to bundle them into 10′ boards with two slats per board. Given the number you need (11) you are inevitably left with one additional slat that doesn’t form a pair, so the 6′ board accounts for this remaining slat you need!